Volhard Dog Nutrition uses dehydration as a method of food preserving which removes the moisture from raw, whole food ingredients. It inhibits the growth of microorganisms. Bacteria, yeasts and molds need water in the food to grow, and drying effectively prevents them from surviving in the food. 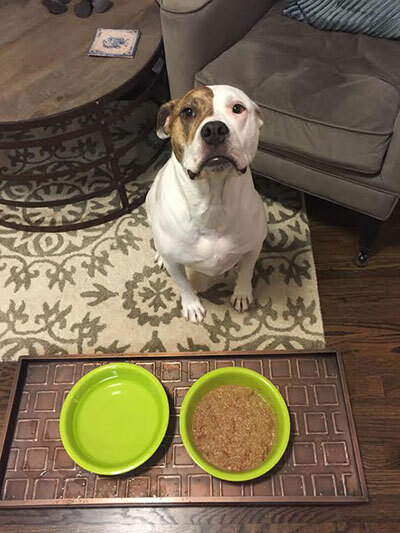 Simply re-hydrate our foods with warm water and add your dog’s favorite meat. VDH uses only human grade, home grown ingredients without preservatives and are completely and proudly made in the U.S.A. WHOLESOME, HEALTHY, SAFE DOG FOOD TO SUIT ANY LIFESTYLE. 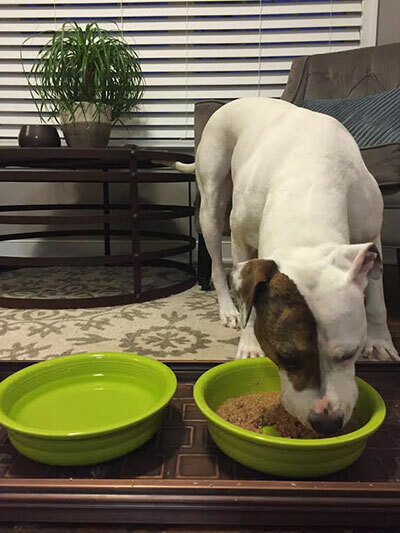 The food we feed our dogs makes a huge impact on behavior, energy and growth. There is a lot of dog foods to choose from. There are some great foods out there and to be honest there are some I wouldn’t even donate to a shelter; they are so deficient in nutrition. Advertising and marketing will try to make you think that the foods that you see the best commercials, with healthy running and playing dogs are the best for you dog, many times that is far from the truth. It seems like we are weekly hearing of a new food or treat company that has placed a recall on one of their products. I encourage you to research the food you are feeding your puppy, dog and senior dog. There are six building blocks of proper nutrition: protein, fat, carbs, minerals, vitamins and water. As your dog grows it is also important to keep in mind that the foods that are rich in enzymes make the difference in good or bad food. All processed dog food that is cooked is deficient in certain vitamins, enzymes and minerals and often doesn’t contain the right amount of nutrients for your dog. When you open a bag of kibble or dry dog food, it is good for 2 weeks. That is why it is super important to look for a kibble that has a sell by date. Once the bag of food is opened the kibble begins to oxidize because of the oils in the food coming into contact with oxygen. The fats will go rancid and there will be a deficiency in vitamins and proteins. So buy small amounts of food and find a food that has a zip lock on it and a best by date. Not all grains are bad for your dog, in fact grains are needed for stool formation and T-4 production. (T-4 values are how vets test for Thyroid issues) But, grains need to be good quality and non-GMO. Some of the things to look for that may mean you should look for a different dog food: Ear infections that won’t go away, smelling like a dog, excessive shedding, stress & anxiety, dull coat, eye issues, crooked whiskers, OCD behaviors, allergies, crazy energy levels, no muscle tone, aggression and behavior issues. Every dog is different, and sometimes it pays in the long run to find the appropriate food for your dog. That could come in the form of a dry kibble, a wet canned food or even a raw or balanced diet. Again, I encourage people to do their research, PLEASE DON’T just go to the grocery store and grab a bag of food for your dog. One of the best resources I have found to compare dog food is Dog Food Advisor. They do a great job comparing ingredients, looking at labels, and keeps updates with any foods that have been recalled. I highly recommend feeding your dog a food that is listed with 5 stars. YES, you will pay a little more for a better quality dog food. BUT in the long run you will be paying less in veterinary bills, quantity of food and training/behavioral issues. Personally I have tried out many different foods with the four dogs that I have owned. Mainly going through different kinds of kibble and troubleshooting with each dog. Each of my dog’s have had different needs, were at different energy levels and all different ages. Recently I made a change with my dogs after noticing they were not doing very well on the kibble they had been eating for many years. The first thing I did was add a supplement to their kibble- Endurance by Volhard Dog Nutrition. Endurance made a huge difference in Leinie and Frappy’s skin, coat and poop. I noticed a difference in shedding and in stress. Now if a dog comes in for training or boarding, Endurance is put on their food and water (with permission by owner). Endurance helps with stress which is inherent in any kind of boarding in a new environment or learning something new. I have already had clients tell me they noticed their dog’s coat looking shinier and more of its natural color. I strongly recommend if you don’t want to make a complete food change, to at the very least add a researched supplement, such as Endurance, to their food or water to add much needed nutritional balance. I also made a complete food switch with my dogs when I saw their health start to improve with the Endurance and a good quality kibble. I had at one time fed a RAW food diet to my Malinois, Lager. He was a growing into a strong powerful athlete and he needed more than the average kibble that I had been feeding him and my older Irish Terrier. But sometimes putting together a RAW diet can be time consuming and take a lot of research and although I did it, I needed something easier with my busy schedule. IF you choose to feed a RAW or Natural diet, please do research, you want to make sure that it fulfills all your dog’s needs. I did more research and found the Volhard Natural Diet Foundation 2 (NDF2). During the manufacturing phase, each batch of Volhard dog food is quality control tested, not once, not twice, but 3 times! Volhard efforts are unsurpassed in protecting your dog against the risk of e-coli, salmonella, bacteria, mold and fungi. My dogs love their NDF2, and I know of quite a few other dogs that are loving it as well. The owners like it for the ease in preparation. If you are interested in learning more about it, feel free to email me for more information or how to order NDF2 or Endurance. I will also be the first to mention that it is not for everyone! I am not a veterinarian, a certified nutritionist or even a vet tech, but I do have years of experience feeding dogs, training dogs and troubleshooting behaviors and energy levels. I can’t stress enough that not all dogs are alike and not all foods are alike. Some foods work great for some dogs and some foods are just toxic. I do try and help people make an informed decision about the food they feed their dogs. But just as I would never tell you what to eat (go ahead and have that veggie burger or Bacon) I will try to help you understand that you can do better than a fast food burger made by a clown. Do some research! Feed your dog to live and be happy. Feed them so they can look and function as they were bred to be. Feed them so they can perform any task. Feed them so they can live longer. Feed them so they are healthier. Feed them so you can spend more time with them and less time vacuuming up their fur and taking them to the vet.